Hiya guys! Another day, another post ready to rock your wallets. It's a two-way street though because enabling you, ends up enabling me in the long run. We are in this together folks, polish addicts stand strong haha. 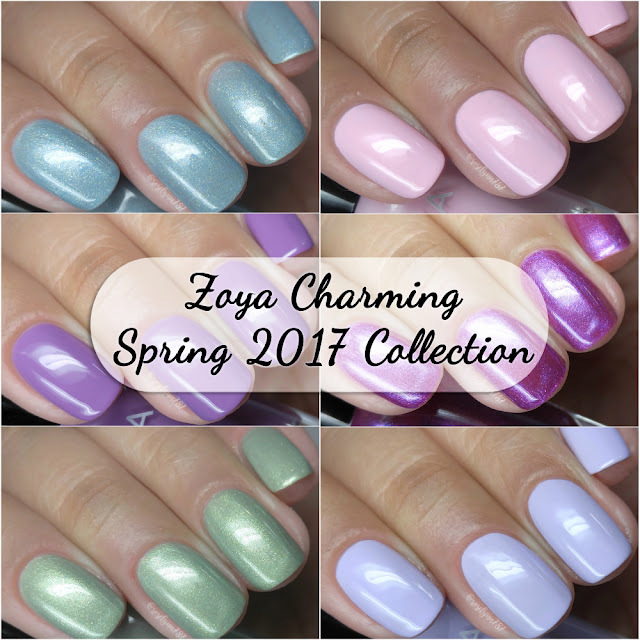 For today I'm sharing swatches for the Charming Spring 2017 Collection by Zoya, which consists of three creams and three micro-sparkles. Let's jump right into the swatches! The Charming Spring 2017 Collection by Zoya is available for purchase online. Each full-size bottle retails for $10 or you can grab the entire collection for $60. Jordan can be described as a soft blossom pink cream. What's springtime without a little pink! And this one definitely hits the nail on the head. Very bubbly and gives off that dainty floral feel. It basically captures the essence of the season nicely. The formula has a sheer consistency, leans a bit on the patchy side on the first layer. The consistency is also thin, though it does not run. Very good self-leveling and ends up looking very smooth. Shown in two coats and sealed with a glossy topcoat. Abby can be described as a light lavender cream. Doesn't this just scream luscious?! I thought this was just going to be 'another' lavender, but I was wrong. It's a subtle wow factor, but it definitely caught my eye. Plus I am loving the way it looks against my skin-tone. The formula has a sheer application, but builds-up perfectly even. Very nice self-leveling throughout and it has a balanced consistency as well. As the others, it dries to a super high shine finish. Shown in two coats and sealed with a glossy topcoat. Tina can be described as a medium amethyst cream. The formula has a sheer initial application that ends up building up really well. Consistency wise it does lean on the thin side and it causes it to run into the cuticles during application. Dries to a super high shine finish. Shown in two coats and sealed with a glossy topcoat. Millie can be described as a dewy violet micro-sparkle. Here we have the stand out shade of the collection! Though I do think it's a bit too overwhelming for spring, I am still madly in love with it. The formula has a sheer, almost jelly-like, application. Shown in two coats and sealed with a glossy topcoat. Lacey can be described as a light dewy green micro-sparkle. The formula has a very sheer application that builds up nicely for full coverage. Lots of shimmer and very minimal brush strokes in the finish. Most of which end up blending out as it dries. Good balanced consistency, not too thick or too thin. Shown in two to three coats and sealed with a glossy topcoat. Amira can be described as a soft dewy blue micro-sparkle. Similar application and formula to that of Lacey. Shown in two coats and sealed with a glossy topcoat. To recap, the Charming Spring 2017 Collection by Zoya is available for purchase online. Each full-size bottle retails for $10 or you can grab the entire collection for $60.